focus: is mold anything to worry about and if not, how to deal with it. reminds me of what one needs to provide when asking for mushroom identification assistance. Intern did not understand, offered input as to what mentor might have said to facilitate understanding. wheel of cheese, assignment to cut cheese to put on seaman’s shelf but the cheese is moldy…what to do? Cut wedge big wedge, more than 2 lb. Cut ½” – 1” off exterior sides, knife never touching mold, to produce a mold free wedge to wrap for Seamans, bring the rest home. But, Kj doesn’t comprehend what the mentor is looking for in this manner at all. It wasn’t about what to bring home but rather what needs to be done to get clean cheese into the store. “What was brought home was 2 wedges of cheese with mold on the rind. Kj also wonders how that could have happened. 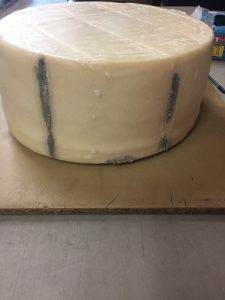 Why was it not understood that the purpose of the whole exercise was to get mold free cheese cut and wrapped to put on the shelf at seamans? What was to come home was just the discard, even tho that moldy cheese is really good. Ok, so what could have been said, written to help produce increased understanding? Hmmm… kj thinks that getting an intern to understand why they are doing a job is important but in this case, did the intern not understand that he was cutting cheese for the store? The emphasis on what is coming home misses the point. I think the emphasis on the end product was and is always a clean, mold free product for seamans…not what to bring home. Wasn’t the town assignment ‘cut cheese for seamans”? Kj likes the intern’s feedback toward improvement processes and it is possible that the task assignment was not clear. But, kj does not understand how the cutting of cheese for seaman’s switched to the emphasis on what to bring home. And, the fundamental misunderstanding/comprehension of the task at hand appeared to cause the confusion. kj wonders if it all didn’t get over-complicated, possibly because the whole goal of getting ½ lb portions of mold-free cheese into the store was forgotten and/or that the intern’s brain was somehow thinking mold would be cut out of cheese. I am not sure. Intern possibly identifies root cause, i.e. personally fixated on “cutting both of the mold spots out of the cheese at once in one big wedge…”.and goes onto say “… because of this, I could not adequately process…”. kj agrees with the intern here … preconceptions, assumptions, projections potentially prevented the intern from hearing what the mentor was trying to get across; on top of the fact that the fundamental goal of the task appears to have been forgotten. kj thought that is actually what the mentor did say, but it must be remembered that kj has also had a lifetime of experience cutting a variety of cheeses and also understood that the goal was to cut/wrap mold free product for the store; bringing home the excess so it would not go to waste. The mentor could not have known that you were bound and determined to deal with the mold spots separately, etc. Kj thinks that if the intern had told the mentor what he was thinking right out of the gate, the mentor could have re-directed him. However, it appears to kj that it was the intern’s inability to clear preconceptions from his mind that prevented the successful relay of clear instructions. Kj thinks that perhaps the intern should make sure the assignment and goal are clear, i.e. my mission is to get ½ lb packages of mold free cheese into the store. How to do that? kj encourages people to develop practices to help clear one’s head, reflect upon the situation, pull together one’s own thoughts, suspend the assumptions before contacting a mentor. If one has a whole string of preconceptions and assumptions it is very difficult to listen to any mentor. In other words, if an intern already thinks they know what and how, then it is going to be very confusing if the mentor provides instructions that don’t fit the assumptions. It is not necessarily the mentor’s shortcoming. So, Kj isn’t sure the emphasis should be on telling the mentor what they should or should not say but rather to further develop listening skills, active and reflective. And, to be fair, it sounds like the intern did not have any experience cutting cheese, any previous history with mold and had not been walked through the process with the guidance of a mentor. Was the intern sent to town with an assumption that he already knew how to cut aged cheese, that almost by default has mold on it, for display in a store? So, again, kj appreciates the interns efforts to address communication challenges but in this case, it appears that the burden of responsibility may have been shifted toward the mentor instead of the intern accepting responsibility to go slow, avoid making assumptions, avoid taking things personally, and clearing his brain prior to receiving new info so that the mentor’s instructions would be heard and if not, to seek clarification every step of the way. Kj thinks it is fabulous that the intern thought to look for guidance in google docs but also wonders if the intern has up-dated the google docs guide materials after all of the time that was taken to explore this topic and write this log entry. After all, a future intern may find themselves in the same boat. However, kj is not in the position to assign any such task. Thank you for the opportunity for me to share my perceptions, comprehension and $0.02 on the topic. I am not seeing any reply from the mentor and am wondering what he thinks about this extremely valuable log entry. Of course, communication is my passion so I may be more inclined to participate in such dialogues. Hi kj, thanks for the input. I realize my frame of mind may have been the leading cause of this issue. I recognize a need that I have for developing better skills for clearing my head and refocusing on the goal(s) and task at hand after being disrupted. I hope to work towards establishing a personal practice for this. On updating the Google Docs, this has been discussed with CF and the project is not currently being pursued. I would also like some feedback from CF on this post. Cheese wedge photo added to original post.